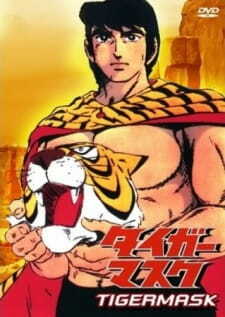 The main antagonist in the manga and anime was Tigers' Den, a mysterious organization that trained young people to be villainous heel wrestlers on the condition that they gave half of their earnings to the organization. Tiger Mask was once a member of Tigers' Den under the name "Yellow Devil", but no longer wanted anything to do with them, instead donating his money to the orphanage. This infuriated the leader of the organization and he sent numerous assassins, including other professional wrestlers, to punish him. first i'll start telling why I consider it a masterpiece( i'll keep it brief), this the show that introduced into anime, I mean it isn't easy to tell you how amazing this classic masterpiece is. And i still can't believe that nobody wrote a review for it yet, Tiger mask is a story about wrestling, this will be your first impression when you watch it for the first time but believe me its about so much more, and I don't want to keep you detailed about the story. my advice just keep watching it. And also a small note if you're a fan of wrestling you better check out this anime, cuz i have one word and it's Awesomeness. Story: As I said earlier the story evolves about wrestling and a famous wrestler who's loved by everyone and tries so hard to keep his identity secret. I don't want to give you a summary about the story, but as you keep watching you'll be interested in some of the characters stories, especially the protagonist ( Naoto Date). Art: Well the art was the typical 70's anime, but what really makes it exceptional is the amazing fight scenes it's just there is also fluid action in it, and also the character's design most of them are very well detailed, especially when they show emotions, I mean the art of this is just amazing for me. P.S. my most favorite thing in this anime is tiger mask's special moce sequence I won't spoil it for you but it's just amazing how he jumps around the ring. Sound: Well the sound effects is sometimes is good and the other times is a let down. But the first i watched this show it was dubbed on my language (Arabic) and believe me the voice acting was amazing in my language, but then I also watched couple of episodes in Japanese and it was also good. Character: This is maybe the strongest point in this series, I mean there is so much variety between the characters, especially the wrestler villains I mean you won't find anyone with the same style and characteristics. Also what I like about the protagonist ( Naoto Date) is how he changes his personality between the courageous, tough and loved by everybody tiger mask into a lazy, eccentric and a bit of a joker reporter ( that's his real identity). Enjoyment: Anybody who loves watching wrestling but with a lot of bloody and broken noses, a lot of character development, and also a bit of comedy, This show is for you. In 1988, at the age of 22, Kentaro Miura produced a 48 page publication. This served as the prototype for what almost 10 years later became the 25 episode cult animation Berserk. Read on to find out more!